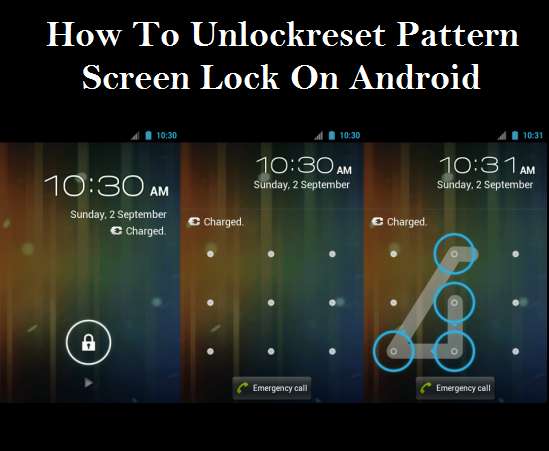 Friends today in my this article I am going to show you how can you unlock pattern screen lock on your android phone. Unlock Pattern With Your Email Account. 2. Click on the “OK” button. 3. Now in the lower left corner you will see a option like “Forget Pattern” click on that option. 4. It will ask you your Email and Password which you have used in your android phone just enter Email and Password. 5. Your android phone will check your email and password which you have entered and you can reset your Password. 1. First of all switch off your android and wait for just 5 seconds. 2. Now press “Volume Up + Home Key + Power Key” together until your phone start booting. Note: If your android phone has not “Home Key” then you can use “Volume Up + Volume Down + Power Key” together until your phone starts booting. 3. A screen like DOS will appear with different option use “Volume Keys” to scroll down and up in the menu and find. “Restore Factory” “Defaults” or “Delete All User’s Data” according to your android phone. 5. Now when your android will start it will not show any type of password field or pattern lock you have turned off all the security options but your data has been lose. 2) Now copy the “Aroma File Manager” in your memory card and inset the card in your android phone. 3) Now press “Power Key + Volume Up” together for entering into your android’s “Stock Recover” if these keys does not work then you can use Google for finding your device’s “Stock Recovery” keys. 5) You need to flask the selected file. 6) Aroma will open in the recovery mode. 8) Repeat the step No. 4 and 5 once again. 9) Now you will get the “Aroma File Manager” opened. 11) Now exit the “Aroma File Manager” and Reboot your android phone once again. 12) When your device get started you will see a Pattern/Password field whatever you have set on it type any Password/Pattern and unlock your android phone without data lose. Note: In the step No. 12 the Password/Pattern which you will enter that will your new Password/Pattern.